Apply these 7 strategies to save on lipstick, mascara and more so you're on trend — and on budget. Cosmetic advertisements are everywhere — YouTube tutorials, Instagram posts, traditional print media — making them hard to avoid and even harder to resist. But if you bought every colored mascara and glitter eyeliner you saw, your wallet would surely suffer. So how can you afford to keep up with the latest beauty trends? Here are seven ways to look the part without paying nearly as much. Try out a sample before you buy the full product, recommends Liz Kennedy, a beauty expert. “Brands are willing to send out test samples if you want to reach out,” she says. You can also go to a department store in person and ask for a sample. Kennedy says the staff would be willing to accommodate you because they want you to become a repeat customer. Samples are especially helpful if you’re interested in something you haven’t worn before. After all, you won’t know how you look with that bright orange lip until you try it, says Marie Watkinson, a massage therapist and owner of Spa Chicks On The Go, a mobile spa event company in New York City. You don’t have to buy the top-of-the-line brand for every item in your makeup regimen. In fact, more expensive isn’t always better. One money-saving strategy is to spend a little more on a few important items and consider budget brands for the rest. If you do want to test out a bold trend, know the store's return policy. Glitz and glamour can sometimes look better in the picture than it does out of the box and on your skin. Of course, don’t buy a product with the intention of returning it, but know your options in case you regret your purchase. Some stores will allow you to return the product, even if you already opened it. There are certain times of the year when makeup goes on sale. If you’re interested in a product that’s a little out of your budget, try to time your purchase around these discount periods. For instance, many beauty retailers offer Black Friday deals on the day after Thanksgiving. Other stores host recurring sales. Ulta, for example, holds a semiannual sale called the 21 Days of Beauty in spring and fall. Online, search for a coupon or coupon code before you check out. And try to buy everything you need at once so you can meet the free shipping minimum. You can also save money based on where you shop. 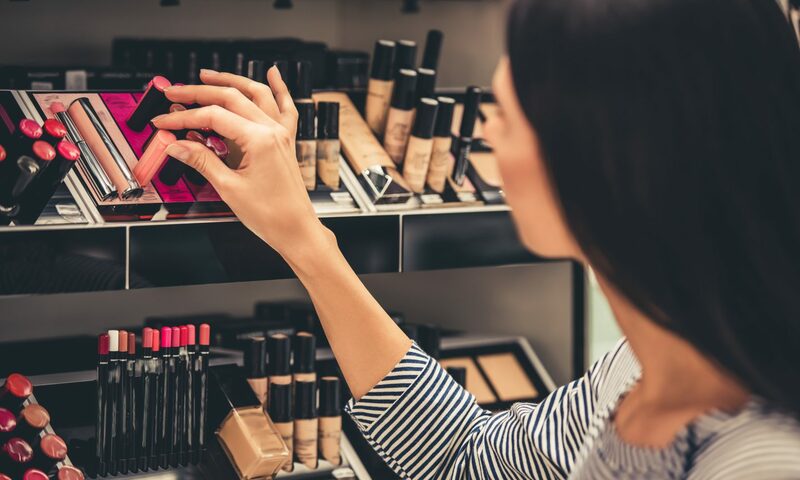 Watkinson recommends looking for makeup at stores like Target, Kohl’s, T.J. Maxx and even your local drugstore. Don’t feel limited by the department store, which often carries expensive brands. Choose products strategically, Watkinson advises. One purchase could serve multiple purposes. She gives the example of a blush or bronzing brick that can be used on your cheeks as well as your eyes. And look around your kitchen. Watkinson says she’s used olive oil to remove her eye makeup. Not every item will work for every skin type, but trying something you already have around the house is much more affordable than purchasing expensive versions. If you’re going to buy beauty products regularly, consider signing up for a loyalty program. Brands like Urban Decay and MAC Cosmetics have rewards programs that give repeat customers perks, such as special offers or faster shipping. You’ll usually rack up rewards based on how much you spend, but don't overbuy to get more points.